For nearly 20 years, Maggie Grey’s Workshop on the Web (WoW) has been an innovative online magazine for all textile enthusiasts. The great news is that WoW is now a book. But not just a book as all who buy it will gain free access to the WOWbook Members’ Club. Here, you’ll find more workshops by great artists, videos showing new techniques, Maggie Grey’s online course, a selling gallery and access to the ‘members only’ Facebook pages. In the free online Members’ Club, we find Maggie and Amo House. Amo is working on ammonites while Maggie will be looking at extensions to her embellisher technique (including a video to illustrate it). More content will be added to the Members’ Club throughout the coming months. Maggie’s Course will be continuing with new ideas, focusing on building up from backgrounds and including many new techniques. Bought the book? Go to the Members’ Club (for the extras) with the book to hand for the password. See you there! As usual in the new WOWbook we have some wonderful artists. Margaret Beal wields her soldering iron while Carol Coleman builds up a panel with machine embroidery. Jan Evans introduces foam printing techniques and. Maggie Grey is whizzing away with her Embellisher machine and hand felting punch. Solar reactive film offers some great possibilities and Adele Thomas and Dee Priest show how the resulting prints can be used. Cas Holmes is our star for the interview section. Click the pics on the right for further pics and more information. The strength of the WOWbook lies in the Members’ Club. Hosted on this website, it gives us the chance to provide all who have purchased the book an extra six months of online workshops and videos, all included in the price of the book. 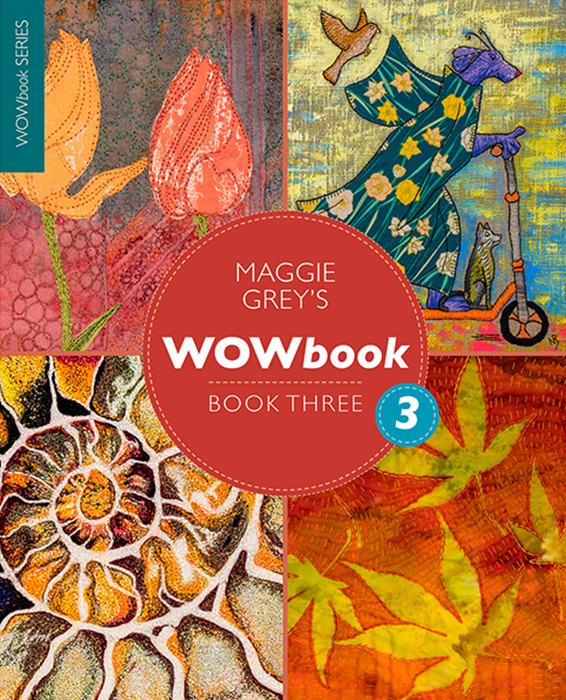 Also included is Maggie Grey's Multi-coloured WOW Course where she is exploring exciting techniques for backgrounds, which form the basis for intriguing textiles. The Members’ Facebook group has been a great success in encouraging participation that goes far beyond the book. The Gathering Memories project, where textile artists submitted work to be auctioned to raise funds for the Alzheimers Society, raised over £7,000. I always begin with a pastel drawing and my latest trials have been with Inkjet printable silk (after scanning the drawing).